Senior Moments was presented 3 weeks ago as Coal Creek Community Theater’s entry in the Colorado Community Theater Coalition Festival at the Nomad Theater in Boulder. The production took 3rd Best Production, and Tim Englert won the Best Actor prize. That’s not bad for a show with 2 actors, a table and 2 chairs; we were up against productions with up to 40 actors and full-stage sets! 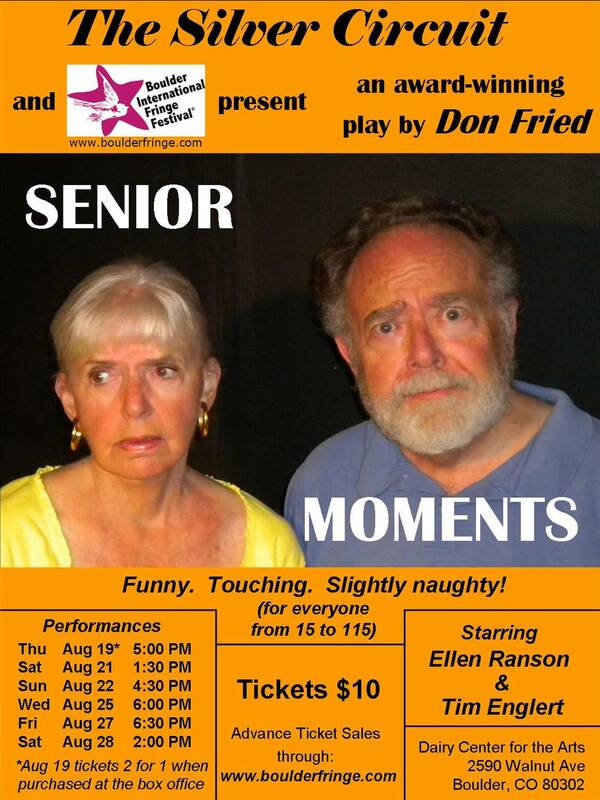 Senior Moments will have 6 performances between August 19th and 28th at the Boulder International Fringe Festival. I’d love to see you there if you can make it. A few weeks ago, my 10-minute play “The Code” won first prize in the 2009 Front Range Playwrights’ Showcase at Coal Creek Community Theater in Louisville, Colorado. “The Code” is the first play in Senior Moments, a series of 5 short plays I’ve written for Tim Englert and Ellen Ranson, two actor friends of mine, to present at senior residences. Tim and Ellen — they’re “well-seasoned” adults — call themselves the “Silver Circuit” when they tour performing plays for older audiences. Earlier this year, they told me that they were having difficulty finding two-person plays for one older male and one older female actor to present at senior residences. They asked me if I’d be interested in writing something specifically for them. I jumped at the chance. The last two plays I’d written were Shakespeare Incorporated and Postville. Both are large cast, large set, full-length plays and, frankly, I was burned out. So the prospect of working on short, comedic plays was particularly appealing. Especially something with strict requirements — one elderly male and one elderly female actor, minimal set and production requirements — and one which would have have more or less guaranteed productions when I was finished. Senior Moments is now finished and Tim, Ellen and I are scheduled to present it in a dramatic reading at Golden West, a large senior residence in Boulder, on September 24th. After that, they’ll start to perform it at homes for the elderly up and down the Front Range in Colorado. Today there was a wonderful article in the Boulder Camera newspaper about Tim, Ellen, Silver Circuit, and “The Code.” Take a look.